Superkicks is a fun-filled, action-packed fiction series about a group of girls and boys who compete to join a very special football training program—the Superkicks football program. Organized by sports entrepreneur, Dr JJ Khan, the initiative aims to help young football geniuses achieve their dreams of becoming professional football players and coaches. 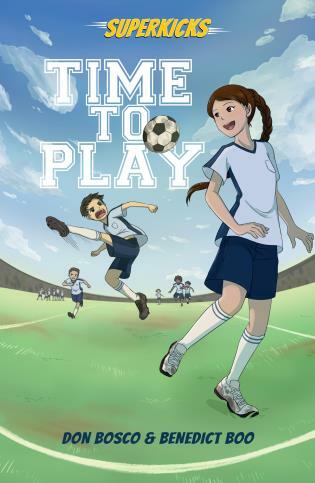 In this book, Lee Jin, captain of his school's football team, tries his best to get his team into the Superkicks selection amid objections from his coach and school principal. Football is everything to him and it's always been his dream to play it professionally—this was his chance! However, there is a mysterious girl in his school who might be a better player than him! What can Lee Jin do about the barriers that stand in his way? Don Bosco is an award-winning writer and publisher of thrilling fiction for teens and children. His stories are inspired by Asian legends and pop culture. He started the publishing studio, Super Cool Books in 2011. His books include the popular Sherlock Hong Adventures series and the Lion City Adventures series. He has also been a featured speaker at creative writing events. Benedict Boo is a sports enthusiast. He's passionate about promoting an active lifestyle, especially among the young. Besides marathon running, his other love is football. He plays regularly and is also coaching a team. He has been working in education and publishing for two decades. Creating this Superkicks series is truly a dream come true for him.